It’s time for a SPA Day for our Westheights neighbours, the residents of Forest Heights Long Term Care Centre! Since our first Spring Fling SPA Day in 2013, we’ve been looking for opportunities to care for the residents of the long term care centre next door by pampering them with facials, manicures, flowers, and some calming/enthusiastic company. Last spring, some 34 residents came through our pampering circuit, and what a hit it was! It was a highlight of the season for residents, an inspiration for visiting family members, and a practical way to honour Jesus, who said that when we help those who are sick, we’re helping Him! This year, FHLTCC staff have specifically mentioned the needs of a growing number of younger residents–those in their 30s, 40s, 50s and 60s–who especially enjoy the company of volunteers and visitors, now that the centre is their home. 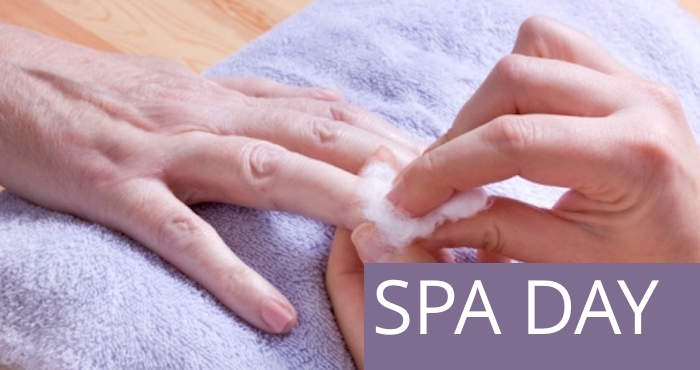 Providing a SPA Day continues to be a comfortable way of connecting with our neighbours–through serving (basin-filling, organizing supplies, serving coffee, pushing wheelchairs, etc.) or through friendly conversations, or both! Individuals and families who are looking to serve together are most welcome. Will you join us? We need a minimum of 16 volunteers to make this a successful event. If you can do any of the following, we can use you! Who: Men, women, students and kids who want to help!